Clematis, Evergreen Clematis armandii spp. (KLEM-ah-tis) Perennial Vine for sun to Shade. Unlimited height and spread. 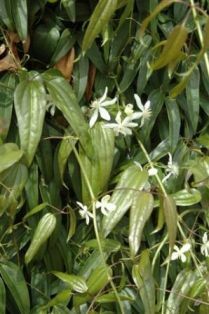 Vigorous semi-evergreen climbing vine with profusion of fragrant 1” white flowers in the late summer. Native to Japan. Also does well in filtered light. Clematis is the long-leafed evergreen vine that flowers in the spring. Easy to grow in any well-drained soil. Low to moderate water and light fertilizer needs. Don’t prune the first year. Climbing vine for fences, arbors, and decorative screens. Spring or late summer flower color. Good for attracting beneficial insects and improving biodiversity in general. Somewhat aggressive.